Part 2 of the previously stated interview with Mike & Bryan. The Legend of Korra has received an Annie Award for Outstanding Achievement, Production Design in an Animated TV/Broadcast Production for Angela Sung, William Niu, Christine Bian, Emily Tetri, and Frederic Stewart. The lunchboxes you find on every article about the merchandise, but it took me a while to find other images: mugs, a magnet set, and shot glasses. Book 2 DVD info extravaganza! Book 2's been officially announced for release on July 1st in the United States and August 5th in Canada on Blu-ray and DVD! (17) Scene Bending Animatics- Take a look at the animation process behind The Legend of Korra. Watch as we show you the process of how the character sketches, layouts, and rough animation became this action-packed scene in Book 2. Inside the Book of Spirits- Get a behind-the-scenes look at the making of The Legend of Korra: Book 2! Join show creators, Michael DiMartino and Bryan Konietzko as they run through the creative process from story concepts to scripting to the animation phase, and more. The Re-telling of Korra's Journey- From leaving her home in the Southern Water Tribe to quickly putting her Avatar skills to the test against the Equalists, get ready to relive the exciting adventures of Avatar Korra in this extended Book 1 recap with 30 minutes of video clips! Kindred Spirits: Tenzin's Family- “Kindred Spirits: Tenzin's Family” is an all-access deconstruction of his familial relationships, from his children to his siblings with interviews by the creators Michael Dante DiMartino and Bryan Konietzko. Audio commentaries- From series creators, cast and crew for four episodes. 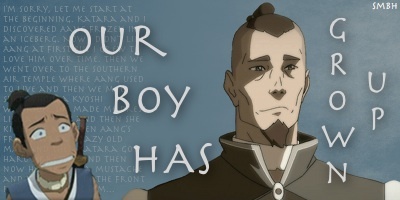 Feuding Spirits: Korra's Family - “Feuding Spirits: Korra's Family” is an in-depth look at Korra’s entire family dynamic, from her father to her uncle with interviews by the creators Michael Dante DiMartino and Bryan Konietzko. Release date: January 2015. Could be a placeholder though. Please do not post unverified leaks & spoilers in this news thread. 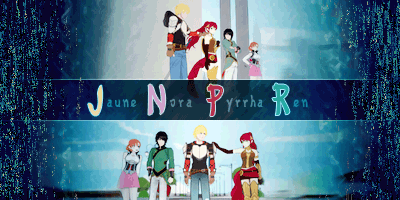 Book 3 is premiering June 27th, 2014! Also, in the source link below, a clip from the premiere is featured. The Legend of Korra fans have been eagerly waiting to find out when the show would return with Book Three, and IGN can now exclusively reveal the date – and the fact that it’s next week! 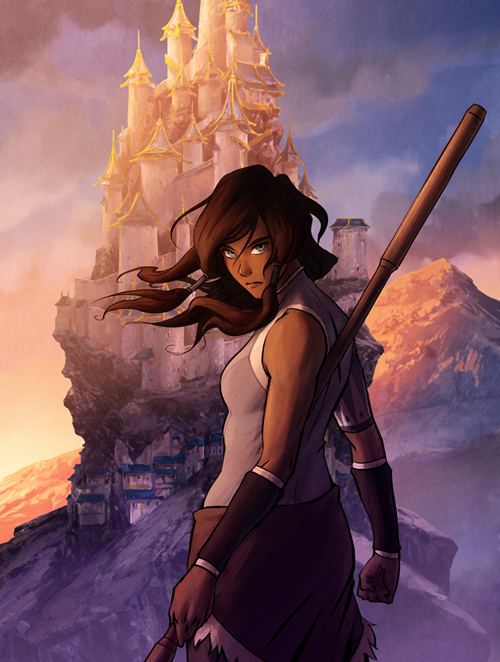 Yes, The Legend of Korra Book Three: Change will debut on Friday, June 27th at 7pm on Nickelodeon. You’ll get a ton of Korra that night, as the first two episodes of Book Three air from 7pm-8pm ET/PT, followed by a special bonus presentation of the third episode of Book Three, “Meet the Family, “ at 8pm. Platinum Games (the game developer for Bayonetta and Metal Gear Rising: Revengeance) is going to make a LEGEND OF KORRA game to PC, Xbox One, Xbox 360, PlayStation 4, and PlayStation 3. The Hollywood Reporter did an article on Anne Heche in LOK and spoiled the role she's going to play for those who haven't seen the leaks. After this Friday's ONE episode, Book 3 goes on a long hiatus. 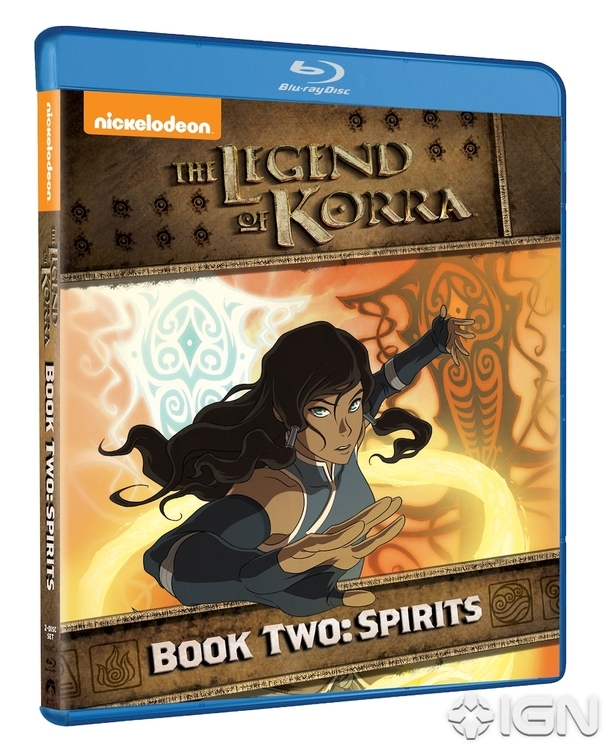 Book 3's been officially announced to be released December 2nd on DVD and Blu-ray in the US! Each 2-disc set comes with all 13 episodes, plus extras that include Audio Commentaries by Creators and Crew (you'll get 4 on the DVD set, and on Blu-ray they'll be on all 13 episodes), as well as Behind-the-Scenes Featurettes with Animatics (again, 4 on DVD and 13 on Blu-ray). Book 4 will be titled "Balance", according to KorraNation. 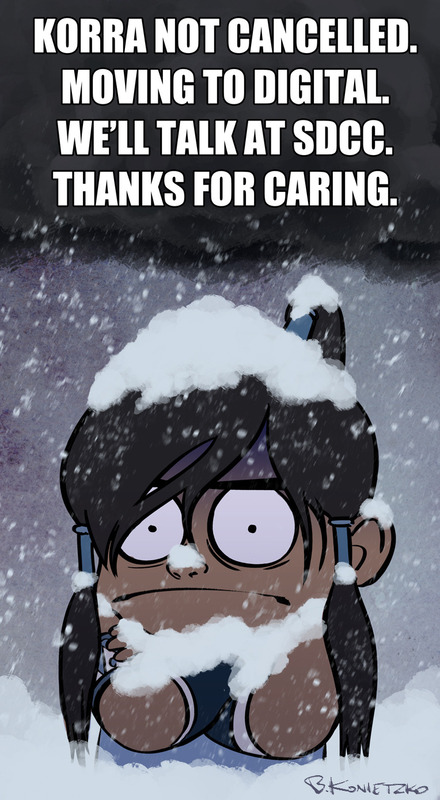 Brian Konietzko confirms via Tumblr. We got a date already! That's the shortest wait ever. October 3 for digital only again. The official trailer for Book Four has been released! IGN has released a new clip!